British-born photographer Platon is named after the Greek philosopher Plato, and although not a philosopher himself he has, apart from talent, an inquisitive mind and an analytical approach to life and his art. In 1992, aged just 23 and still a student at the Royal Collage of Art, Platon was named in British Vogue’s talent contest as the Best Up and Coming Photographer of the Year. This nomination naturally led to many editorial commissions and later work from some of the best UK publications such as Arena, The Face and Vogue. His recruitment in 1995 by the late John Kennedy Jnr to photograph leading American subjects for the political magazine George, gave Platon an interest and a lasting fascination with politics, especially in America, where he now lives. In 2004 he published his first book called Platon’s Republic comprising, 120 portraits of contemporary icons of power, fame, and talent. The book included the noted and much talked about portrait of President Bill Clinton that was to be the last official Presidential portrait of him. The ‘crotch shot’, as the portrait came to be known, appeared on the cover of Esquire magazine in 2000 and was considered very controversial and provocative, raising Platon’s profile worldwide. 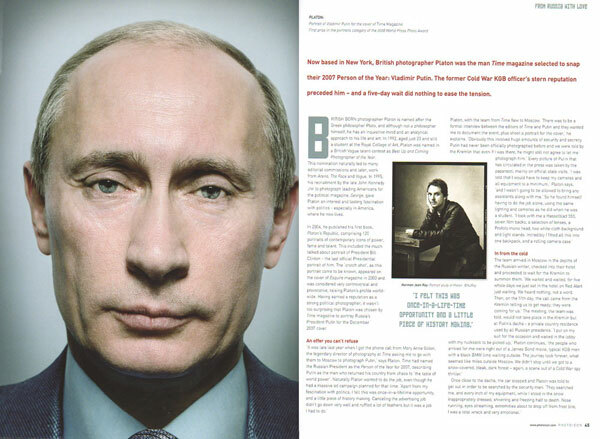 Having earned a reputation as a strong political photographer it wasn’t too surprising that Platon was the one chosen by Time magazine to photograph Russian’s President Putin for their December 2007 cover. Five days of waiting and anticipating, a rollercoaster of intense emotions, had taken it’s toll on Platon. “At that moment hearing the nice words being said about me, I just burst into tears, like a big blubbing kid. But with all those pent-up emotions, I just couldn’t help it.” Platon was sure he’d blown it. It was hardly fitting behavior from ‘the greatest portrait photographer in the world,’ and he was sure Putin would say no, but instead, he willingly agreed. “I couldn’t believe it. I pulled myself together blew my nose and jumped to work,” Platons laughs. “I asked him to sit on his famous chair, his ‘throne’, and started shooting again. There I was, in this historic room full of secret service men, Vladimir Putin, and me, while I tried desperately to think of something to say to lighten up the gloomy atmosphere that was hovering in the air. I said ‘you are the top man Mr President,’ and he smiled; then I remembered that he had recently met Paul McCartney, so I asked him what he thought of him. Apparently he liked him very much, and then I told him I was a great fan of the Beatles and asked which was his favorite Beatles song. ‘Yesterday’ he replied. When the shoot was over and the official portrait achieved, Putin turned to Platon and asked him if someone could take a photograph of the two of them together. “No one could believe their ears, least of all me. I handed my point-and-shoot camera to a KGB man and I went to stand next to him for the shot. Smiling I put my arms around President Putin like we were a couple of old friends and the guard took the picture. Later on, once I was back with the Time team, everyone started to freak out about the photo of the two of us. It was the fact that I had touched Putin that was worrying everyone. Apparently in Russia it’s illegal to touch the President unless you are shaking his hand!” An extraordinary end to an extraordinary experience.